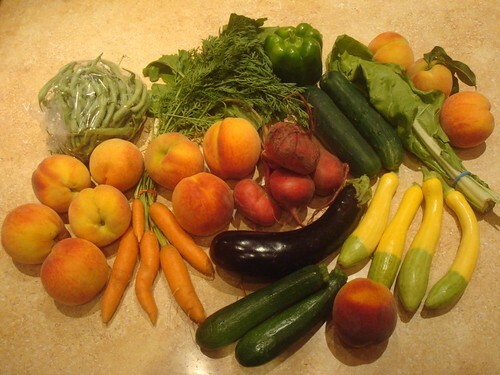 This week's CSA share included lots and lots of peaches (yay for the fruit share!). I peeled and sliced those today and popped them in the freezer to await becoming jam. The eggplant went to a friend. Also included were some sort of greens, squash, zucchini, a green bell pepper, cucumbers, carrots, green beans, and more beets. Dinner tonight will be hamburgers with roasted vegetables, so we will throw the beets, carrots, and whatever else seems like a good idea in the oven with some olive oil and salt. In addition to our CSA veggies we also have these monstrosities given to us by a friend last weekend. Their garden produces super vegetables. 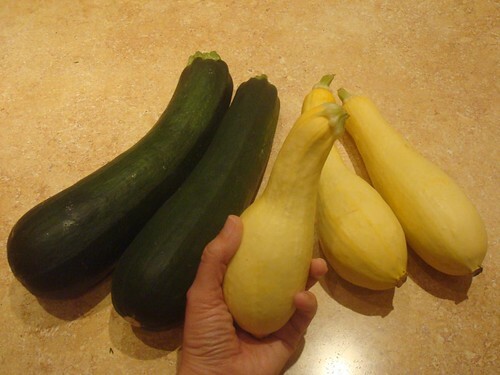 Does the whole "slice and use instead of noodles in lasagna" trick work with zucchini and squash or are they too mushy to hold up? the only squash I'd use for 'lazagna' would be cucuzzi.. which I'm not sure anyone is growing this year...it's a bit early for them anyway. It's a great veggie, solid, unlike the 'summer squash' and takes on the flavor of the surrounding ingredients very well.